The three-word quote, “success breeds success,” is attributed to World Cup Winning soccer player Mia Hamm. While only using two short words, she is accurately describing a feedback loop where achievement is continually reinforced through prior achievement. Successful retailers certainly know about this feedback loop and seek to incorporate it into their daily operations. How a retail establishment not only differentiates itself from its competition, but also builds on the things it does right, are critical in perpetuating the cycle of success in today’s omnichannel marketing world. In fact, a series of different operational loops, each working towards greater and greater business success, are described in a recent MultiChannel Merchant article by John Levitt about Guitar Center, the world’s largest retailer of musical instruments and recording equipment. Customer feedback is important to the ongoing improvement of Guitar Center’s internal and external procedures. The article describes the cycle of success building on success within shipping, inventory, and the overall customer experience. The web application does more than just locate inventory, provide customers with quotes, and then determine sales commission. The app also connects shoppers to associates who specialize in a particular area of music, instrumentation, and recording. 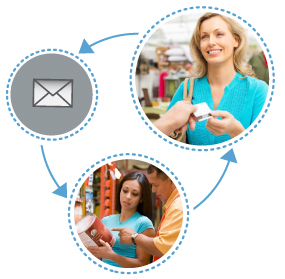 These personal connections between customers and retail associates assuredly drive sales. To learn more about the app that Guitar Center uses to create a loop of successful retail employee engagement, and personalized customer interaction, visit Climb Technology today. While we often hear that we should embrace and learn from our failures, there is no substitute for success. By listening to customers, and by letting them connect to retail store associates, Guitar Center is impressively refining the multiple feedback loops which thread their way through so many aspects of their business. Contact Climb Technology to see how your business can leverage employee expertise to drive customer sales. Or, give us a call at 973-507.9879 and we can discuss how the features of Stores4Stores will build on your company’s cycle of success.